Here is the list of the hotels near Colméry. Book your hotel near Colméry today, Friday 10 May for the best price, reservation and cancellation free of charge thanks to our partner Booking.com, leader in on-line hotels reservation. Below here is the list the 50 closest hotels of Colméry, sortable according your criteria. You will find the position of these accommodations on the Colmery hotels map. Set in Bouhy, Les Forges offers a seasonal outdoor swimming pool, a garden and a barbecue. Guests staying at this holiday home have access to free WiFi. The holiday home includes 2 bedrooms and a kitchen with a dishwasher and an oven. A TV is available. Sancerre is 41 km from the holiday home, while Cosne-Cours-sur-Loire is 26 km away. Set in Sainpuits, Les Bordes features accommodation with a terrace and free WiFi. The villa features pool views and is 36 km from Cosne-Cours-sur-Loire. The 6-bedroom villa features a kitchen with a dishwasher and 2 bathrooms with a bath, a shower and a washing machine. A flat-screen TV and DVD player are offered. Set in Sainpuits in the Burgundy region, Les Cours has a terrace and garden views. Guests staying at this holiday home have access to a fully equipped kitchen. Sancerre is 43 km from the holiday home. La Forgerie is a holiday home with a seasonal outdoor pool, located in Sainpuits. The holiday home is 16 km from Guedelon Medieval Castle. Guests benefit from free WiFi and private parking available on site. There is a seating area, a dining area and a kitchen complete with a dishwasher, an oven and a microwave. A flat-screen TV is offered. Other facilities at La Forgerie include a sun terrace. Auxerre is 50 km from La Forgerie, while Vézelay is 48 km away. Set in Lainsecq, Bivouac La Montagne aux Alouettes provides free WiFi, and guests can enjoy free bikes and a garden. The tented camp offers a sun terrace. After a day of cycling or hiking, guests can relax in the shared lounge area. Auxerre is 47 km from Bivouac La Montagne aux Alouettes. Offering free WiFi and garden views, Gite Bourgogne is an accommodation situated in Dampierre-sous-Bouhy. Guests staying at this holiday home have access to a terrace. The holiday home consists of 6 bedrooms, a living room, a fully equipped kitchen with a dishwasher and a coffee machine, and 3 bathrooms with a bath. A flat-screen TV is offered. Sancerre is 42 km from the holiday home. Set in Perreuse, Le Tribunal features a private pool. Guests staying at this holiday home have access to a fully equipped kitchen. Boasting pool views, the holiday home is fitted with a TV with satellite channels, a seating area, a wardrobe and 4 bathrooms. Auxerre is 47 km from the holiday home. Situated in La Poterie in the Burgundy region, the holiday home has a terrace. Guests have access to free WiFi. Offering direct access to a patio, the holiday home consists of 3 bedrooms and a fully equipped kitchen. A flat-screen TV with satellite channels is offered. Auxerre is 42 km from La Poterie, while Vézelay is 43 km from the property. Domaine des Forges de la Vache is an 18th-century manor set in a large park, just in the edge of the Bertranges Forest. It features a furnished terraces. Free WiFi access is provided. Each room is individually decorated and includes a private bathroom with bathrobes and free toiletries. A continental breakfast is served upon reservation, and you can enjoy homemade meals on request. With free private parking on site and ideally located to discover this wine region, Domaine des Forges de la Vache is 15 km from Pouilly and 30 km from Sancerre. La Charité sur Loire Train Station is at 5 km. Holiday home Le moulin bleneau is situated in Dampierre-sous-Bouhy. This holiday home offers barbecue facilities. The holiday home includes 3 bedrooms and a kitchen with a dishwasher and a coffee machine. A TV is offered. Sancerre is 44 km from the holiday home. Gite du Vieux Charme is set in Saint-Amand-en-Puisaye and offers barbecue facilities and a garden. The accommodation is 41 km from Sancerre. This holiday home comes with a kitchen, a seating area, a dining area and a TV. The holiday home offers a terrace. Gien is 45 km from Gite du Vieux Charme, while Cosne-Cours-sur-Loire is 23 km away. La Guirtelle is set in Lainsecq. This holiday home features accommodation with a terrace. The holiday home has a flat-screen TV with satellite channels, a well-equipped kitchen with a dishwasher and an oven, and 5 bathrooms with a bath and shower. Auxerre is 44 km from La Guirtelle, while Cosne-Cours-sur-Loire is 36 km away. Bed and Breakfast Raveau Preferred hotel ! Offering a garden and free WiFi, laurene provides accommodation in Raveau. Fitted with a terrace, the units feature a flat-screen TV and a private bathroom with shower and a hair dryer. A microwave and fridge are also featured, as well as a kettle. A continental breakfast is served daily at the property. If you would like to discover the area, hiking is possible in the surroundings. Nevers is 24 km from the bed and breakfast, while Sainte-Marie is 40 km away. Featuring a seasonal outdoor pool and pool views, Ecrevisse is set in Saint-Amand-en-Puisaye. The property has garden views. This 9-bedroom holiday home comes with a seating area, a flat-screen TV, a DVD player and a kitchen with a dishwasher. The holiday home also provides a washing machine and 3 bathrooms with a bath. The holiday home offers a barbecue. A terrace is available for guests to use at Ecrevisse. Sancerre is 42 km from the accommodation, while Gien is 46 km away. Boasting accommodation with a private pool, La Biche de Forterre is located in Lainsecq. The accommodation is 43 km from Auxerre. The holiday home has a TV with satellite channels, a well-equipped kitchen with a dishwasher and 2 bathrooms with a shower. Vézelay is 50 km from La Biche de Forterre, while Cosne-Cours-sur-Loire is 37 km away. 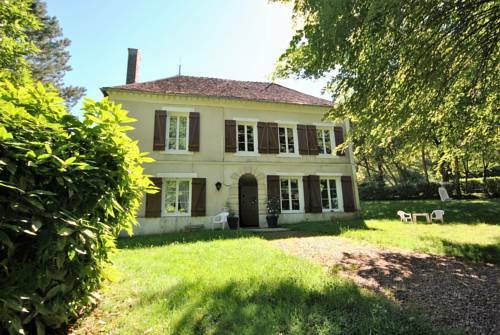 Petite maison is set in Saint-Amand-en-Puisaye and offers barbecue facilities and a garden. Guests staying at this holiday home have access to a fully equipped kitchen. The property includes a living room with a flat-screen TV. The holiday home offers a terrace. Sancerre is 39 km from Petite maison, while Gien is 43 km away. Featuring a garden, La Griotterie provides accommodation in Saint-Amand-en-Puisaye with free WiFi and garden views. The property was built in 1988 and has accommodation with a terrace. The holiday home features 2 bedrooms, a flat-screen TV, an equipped kitchen with a dishwasher and an oven, a washing machine, and 1 bathroom with a shower. Sancerre is 39 km from the holiday home, while Gien is 43 km from the property. Situated in Treigny, 35 km from Cosne-Cours-sur-Loire, La Treille features a garden and free WiFi. There is a private bathroom with shower in all units, along with free toiletries and a hair dryer. A continental breakfast can be enjoyed at the property. The bed and breakfast offers a terrace. There is a shared lounge at this property and guests can go hiking nearby. La bicoque en Puisaye is set in Saint-Amand-en-Puisaye. This 3-star guest house offers a garden. Guests can make use of a terrace. At the guest house, each room includes a wardrobe. Rooms are complete with a private bathroom fitted with a shower, while some rooms at La bicoque en Puisaye also offer a seating area. A continental breakfast is available daily at the accommodation. Sancerre is 39 km from La bicoque en Puisaye. Below here is the hotels map of Colméry. Names and details of Colméry hotels can be shown on the map clicking on the prices icons.